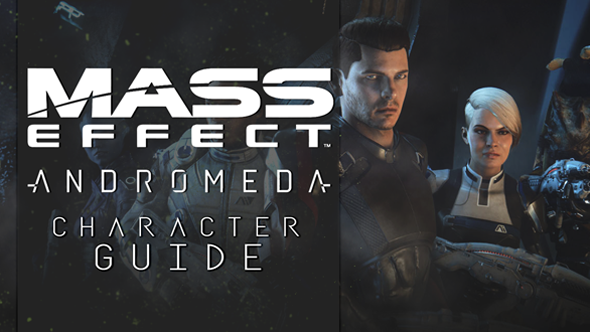 Look beyond the starships, biotics and looming alien menaces, and it’s Mass Effect’s characters – the people (and aliens) with whom you fight, flirt and fu… umble – that are its beating heart. The cast of the original trilogy still fuel fan debates about best squadmates and favourite moments, like Mordin’s merry songs of scientist Salarians, Tali and Legion’s debate over the soul of the Geth, or Garrus’s endless calibrations. If you’d like to know everything we do about Mass Effect: Andromeda, click here for all the details. Hence, no site’s coverage of Mass Effect: Andromeda is complete without a lengthy look at the characters that will make your time in the new galaxy memorable. Here is ours. As with Shepard in the original trilogy, you can customise their appearances, their backgrounds, and their forenames, though if you keep the default, NPCs will occasionally refer to you as Scott or Sara. Your dad and twin always uses their default forename, to avoid the confusion of everyone being called Ryder. You inherit the title of Pathfinder from your dad, the illustrious galactic explorer and N7 marine Alec Ryder (more on him later). It’s your job to scout new planets to settle and solve any problems with doing so. For better or worse, you’re integral to the Andromeda Initiative’s mission, and can expect to be viewed accordingly. Otherwise, who Ryder ‘is’, is up to you. Lead designer Ian Frazier says “as in the trilogy, you can be a jerk, but not a true villain. Ultimately you’re a hero – you decide what kind of hero.” You can react to others’ statements with one of four tones (casual, professional, emotional, logical), and as you do so, Ryder’s personality will settle accordingly, unlocking corresponding interactions – a hot-headed, emotional Ryder will be able to say and do things that a cool, collected Ryder won’t, and vice versa. Andromeda’s morality system is more nuanced than in the past, allowing for more shades of grey, but you still can’t be a truly evil person. Just know that there are consequences, with other characters referencing your earlier choices and comments. When it comes to your look, you can’t change the default Ryders, but there are other human presets to choose from, all of which can be tweaked. As the Andromeda Initiative isn’t a military venture, you’ll also find a few more flamboyant haircuts than in the original trilogy. More importantly, you can choose Ryder’s military training, which determines your initial combat abilities. More on that in our combat guide. One more thing: Ryder can get a pet pyjak – a space monkey – and it can wander around the Tempest. These are the guys, girls and monogendered aliens who can join you on missions. They have their own skill trees, and extensive interactions with Ryder – up to and, in some cases, including, romance. Excitingly, loyalty missions – a much-loved feature of Mass Effect 2 – are back. You can build “trust” with your squadmates, and their loyalty mission will unlock at a certain level of trust. Unlocking all of them in one playthrough is very difficult, since some characters’ personalities and agendas conflict with one another. Completing a character’s loyalty mission unlocks a new and powerful skill tree for them. Like the Ryders, Cora arrives in Andromeda aboard the human ark, Hyperion. As such, she’s one of the two squadmates available from the start of the game. Cora is a romance option for Scott Ryder – as was made graphically clear in the New Earth trailer – but she’s not into Sara. Cora is your team’s operations specialist in charge of ground missions, a human biotic, and one of your two starting squadmates. After a career in the Alliance military, she served with Talein’s Daughters, an Asari commando unit, as part of a Council inter-species integration scheme. She is second-in-command of the human Pathfinder team and Alec Ryder’s appointed successor, so she’s understandably ruffled when you get the Pathfinder job instead of her. One more thing: she shares a surname with the human supremacist, the Illusive Man, whose name was revealed to be Jack Harper. Check out our story guide for more evidence of Cerberus’s theorised connection to the Andromeda Initiative, and everything Bioware have said denying it. Liam specialises in crisis response for the Pathfinder team. In the team briefing, we learn he studied engineering at university, but left to train as a policeman. He was “hand-picked” by Alec Ryder due to his multidisciplinary skills. He’s also a Londoner, and thus has a British accent. “Liam is the youthful, enthusiastic, and in some cases, the idealistic follower that you get,” creative director Mac Walters told Game Informer. He’s got high hopes for humanity’s future in Andromeda and will try to encourage the team in dire situations, but he’s also hot-headed and quick to react emotionally if things go south. Sounds to us like a great opportunity for a serious reality check on those youthful high spirits about halfway through the game. Though cheerful, he takes his duties seriously and supports Ryder’s decisions. “He’s got Ryder’s back,” says Walters. We got a look at his loyalty mission at Pax East – you help him search for a “contact” apparently captured by pirates, but the footage doesn’t give away much more than that when it comes to the story. The mission itself is a fight through a Kett ship as gravity fields change direction around you, and features a few jokes, showing some of the game’s lighter tone. Liam’s profile says he’s a close-range fighter who moves quickly with his jump jets, and favours ‘overclocked dual omni-blades’. His favourite ability is ‘havoc strike’, in which he leaps forward to stun enemies and prime them for combo detonations. In Mass Effect 3’s multiplayer, havoc strike was exclusive to the Turian Havoc Soldier, which will return as a class in Andromeda’s multiplayer. Peebee is an Asari, but if you think you know what to expect from previous experience, you’re probably wrong; she has little in common with the po-faced Liara or Samara, or the femme fatale Morinth. BioWare wanted to play with your perception of alien species, so your new Asari will be flighty and blunt rather than solemn and diplomatic. I guess that’s the nature of a colonisation mission; it attracts the misfits. Her name is actually a nickname, a contraction of her full name Pelessaria B’Sayle. She hails from Port Lerama, capital of the planet Hyetiana, a hub for Asari science and education. Bored with the Milky Way, she came to Andromeda aboard the Nexus, but soon went roaming on her own; her profile describes her as “pathologically independent”. She’s interested in the alien technology which you investigate as you explore the Heleus Cluster, and as such, your paths will cross early on. We got a look at Peebee’s thirst for treasure-hunting in footage of her loyalty mission, courtesy of IGN. Having tracked a signal from the mysterious Remnant to a very hostile lava planet where the Tempest can’t land, Peebee tricks you into an escape pod and launches you at the surface. It seems she has a rival, another Asari named Kalinda, who tries to steal her discovery from under her nose. Peebee’s profile says she is a gunslinger and a “biotic destabiliser” when it comes to combat, with her favourite weapon being a Sidewinder Outlaw pistol and her favourite power being “Invasion”. As we found in our hands-on time with the game, that’s actually a new tech power, not a biotic one. It releases a swarm of VI drones at a target, weakening their defences, and can be upgraded to spread to nearby enemies. Interestingly, Peebee is one of the very few Asari with eyebrows. They’re the result of a recessive gene somewhere in her ancestry. Born on the Turian homeworld of Palaven and having resided in “too many places to count“, Vetra is a drifter, who at some point drifted into the wrong crowd: she has survived the rough world of smugglers and mercenaries, sharpening her street smarts and adaptability along the way. She’s a good person to have with you when dealing with crooks. Her experiences have also taught Vetra the value of having someone to watch her back – she’s fiercely loyal once you prove yourself worthy of her trust. In combat, she favours her modified Cyclone assault rifle, and wears customised power armour which provides reinforced shields when activated. Vetra features briefly in the New Earth trailer, and appeared for the first time in a gameplay trailer from The Game Awards 2016, where she accompanied Sara Ryder and Drack (see below) on an away mission to the planet Kadara. If you fancy hooking up with the savvy Turian, it’s looking like she’s a romance option with either gay or bisexual tastes – this is based on our time with the early access trial, so don’t take it as 100% confirmed just yet. Danielle Rayne provides Vetra’s voice – she appeared in Revenge, Hawaii Five-0 and the short fan film Portal: No Escape. Also: she’s tall, and will have her own unique rig (like many alien races) to keep her that way. Drack is a very old male Krogan. Given their fondness for violence, this should tell you a few things about him right away: he’s seen a lot of fighting, and gotten very good at it. According to his profile, Drack “spent more than 1,400 years causing a ruckus in the Milky Way – wearing the title of soldier, mercenary, and at times, pirate.” This would mean he is old enough to have been born during the Krogan rebellions, which ended in around 800 of the Council Era (CE), with the Andromeda Initiative leaving the Milky Way in 2185 CE. He has plenty to say about the genophage and the galaxy’s treatment of his species. Drack’s profile describes him as a veteran warrior and close combatant, who favours a Ruzad shotgun – apparently, ‘Ruzad’ is the Krogan for ‘judgement’. Ian Frazier has also said that we’ll see “an entirely new Krogan gun, sort of a spiritual successor to the Claymore“, but since that gun was so rare and powerful, we’d be a little surprised if Drack’s starting weapon was its successor. His favourite ability is Blood Rage, which enhances his melee damage, damage resistance, and health regeneration – this sounds functionally similar to Grunt’s Krogan Berserker ability. He has the incinerate tech power, but otherwise, he’s all about combat skills. We’ve met Drack’s clan before. If Wrex leads Clan Urdnot in Mass Effect 2, a Clan Nakmor ambassador and two warriors can be found in the Urdnot camp, intent on negotiating an alliance. Most of Clan Nakmor joined the Andromeda Initiative, and Drack tagged along, tempted by the promise of a whole new galaxy full of stuff to shoot. A video profile courtesy of IGN states that he’s also very dutiful, sticking to his role on the Nexus and to his granddaughter, Kesh, who serves as its superintendent. “He’s a guy with a lot of heart,” says Bioware writer Cathleen Rootsaert. @sneakywtchthief We're being pretty hush-hush on who does and doesn't have a romance, so I can't say. But if we did, I'd call it Kromance. Jaal is an Angara, who sit alongside the invading Kett and the ancient Remnant as one of the three species native to the new galaxy. You are not the only ones suffering at the hands of the Kett; in another IGN profile, Cathleen Rootsaert reveals that Jaal is a high-ranking member of the Angaran resistance against them. He joins your team as a kind of liaison between you and the Resistance, but is also not satisfied with his place and direction in life. He goes on quite the arc as he adjusts to his role on your team. It’s been about 80 years since the Kett arrived in the Heleus cluster and started beating the Angara up. Once an advanced race, they haven’t fared well against the Kett so far, which is where you come in. Rootsaert says the Angara “as a species are very free with their emotions”, openly expressing sorrow, joy and anger with tears, hugs and punches to the face. In our preview, we certainly found Jaal very direct – a trait magnified by his incomprehension of Milky Way idioms. Imagine Drax from Guardians of the Galaxy and you’ll get an idea of the kind of humour you can expect. It’s also confirmed that Jaal will be a romance option. Six squadmates is all we get for now, but at one point in development, seven squadmates were planned: that leaked survey said “you will recruit seven distinct crew members to fight by your side”, and Eurogamer spoke with creative director Mac Walters in December last year, who revealed that a squadmate had been cut. Walters uses the masculine pronoun, so he was male, and Eurogamer’s interviewer assumes that he was Salarian. Walters seems to accept this suggestion, saying “part of” the decision to cut him was that “we have a Salarian on the crew”, referring to your pilot (see below). In that interview, Walters says “it is possible” that the cut squadmate will return. If there’s any chance of a seventh squadmate, it’ll happen via DLC. Every band needs its roadies – these are the people who make it all happen behind the scenes while you and your squad are out exploring. They live alongside you on your sleek new scout ship, the Tempest, and keep it all running smoothly. They all have lots to say, and some can be romanced. Note that while only squadmates have loyalty missions, “other crew can have missions of their own“. Meet your new pilot. Kallo Jath is a male Salarian who helped to design the Tempest, so who better to fly it? He narrates the briefing that walks you through it and the Nomad. It’s nice to know we’ll have a Salarian to chat with on the bridge, even though there’s no conceivable way for Kallo to be as cool as Mordin Solus. As the doctor who gives you a checking-over after you’re thawed out of cryosleep, Lexi T’Perro is one of the first faces you see in the Andromeda galaxy. She transfers from ark Hyperion to your ship, the Tempest, where it’s her job to look after the Pathfinder team’s physical and mental wellbeing. As creative director Mac Walters says, “you can go to Lexi and get opinions from her about how you’re playing the game, and how people are reacting to the decisions you’re making”. This is helpful for anyone looking for pointers on keeping morale high or forming certain relationships within the crew – she’s your wingman/wingperson. Wing-Asari. Whatever. She’s voiced by Game of Thrones actress Natalie Dormer, and has “her own things that she’s dealing with”, including a rivalry with Peebee, a bit of a crush on Drack, and the pressure of taking care of the Andromeda Initiative’s biggest, best hope (that’s you). Gil is the Tempest’s engineer. He’s voiced by Gethin Anthony, known for playing Renly Baratheon in Game of Thrones. As fans will know, Renly was the husband of Natalie Dormer’s character, Margaery Tyrell. Gil says he came to Andromeda to find a purpose for himself, and he responds well to a bit of flirting from Scott Ryder. He’s a pretty colourful personality with a bizarre sense of humour – one of lead designer Ian Frazier’s favourite things about him, but which will probably divide fans. You can see a little more of Gil in IGN’s tour of the Tempest, where he discusses getting the Nexus up and running. Suvi is a young Scottish lady who serves as the Tempest’s science officer. She sits across the bridge from Kallo, gazing at the stars. She is one of Ian Frazier’s “favourite characters”. Suvi is religious, and speaks openly about her faith in an airy Scots’ brogue. She sees science and religion as complementary, with the former as a means of understanding “the divine intelligence behind all of creation.” Gamespot have a cool piece discussing her place in Mass Effect’s tradition of exploring philosophy. Suvi also has a slightly ditzy streak, which is on show in IGN’s tour of the Tempest – following a family tradition, she licked a rock while exploring, and contracted some kind of rash. She is voiced by Glaswegian actress Katy Townsend, who has also appeared in Fallout 4 as Cait and something called ‘Monster High: Electrified’. SAM stands for Simulated Adaptive Matrix. It’s an AI designed by Alec Ryder himself, and sees and feels as the Pathfinder does via a neural link. The Pathfinder team briefing mentions the first such links were created by your mother, a Dr Elen Ryder. Thanks to these links and a quantum entanglement communication system, SAM can support you while you’re on missions from its node in the ark. This support includes “situational awareness, problem solving and even tactical enhancements” – SAM’s computing power can enhance your combat abilities in the form of six ‘profiles’. See our combat guide for more on that. Neither crewmates nor squadmates, these are the supporting players who will nonetheless have an important role in the story, whether through villainy, political power or family ties. Meet your dad. Alec Ryder was one of the first humans to travel through a mass relay, and later completed the Alliance’s gruelling N7 training to confirm his status as one of humanity’s best soldiers. According to his assessment in the Pathfinder team briefing, he fought the Turians on Shanxi in the First Contact War, and served as a military attache to the Citadel in the 2160s. A skilled scientist as well as a soldier, he became interested in artificial intelligence “as a means of human advancement” (an interesting choice of words). His pursuit of this illegal technology led to him being dishonorably discharged from the Alliance military, which conveniently freed him up for the Andromeda Initiative. Alec begins the game as Pathfinder for the Initiative’s human expedition – a role which you, as one of his kids, later inherit. As the human Pathfinder he’s worked closely with Jien Garson, the Initiative’s founder; they appear side by side in the early trailers, some of which Alec also narrates. His voice actor is Clancy Brown, whom you may recognise from Starship Troopers, The Shawshank Redeption, and the Warcraft movie (but don’t hold that against him). Andromeda’s main villain, we got our best look at the Kett Archon in the New Earth trailer. He says simply “I am Archon” before demanding that the Pathfinder team “surrender or burn”. This is followed by an attack. Scott Ryder says “we’ve been outplayed. The Archon is a master of his game,” just as we see footage of the Archon unleashing a blast of blue energy, so he clearly has powers of some kind, and we can surmise he’s a skilled leader or manipulator who views you as a threat. Beyond that, we don’t know much. The Andromeda Initiative is Jien Garson’s brainchild; she is its founder and director. She’s a human, continuing Mass Effect’s usual depiction of humans as the most expansionist and ambitious of the Milky Way species. Garson appears in the Andromeda Initiative ‘orientation’ trailer, in which she explains that she will be overseeing the mission from the Nexus. She is voiced by Sense8 actress Jamie Clayton. Jarun Tann is a Salarian politician, prominent in the Andromeda Initiative’s efforts to establish a government in the new galaxy. His voice actor is Silicon Valley’s Kumail Nanjiani, who discusses Tann’s personality in this interview. To be honest, he’s not as effective as you’d hope. Nanjiani says he’s “a little bit in over his head, but doesn’t want anyone to know.” He means well, but also likes power, and plays up his own effectiveness and importance. Nanjiani’s closing thoughts concern the moral shades of grey in Mass Effect, which you’ll navigate in your dealings with Jarun Tann. Featured in the TGA 2016 trailer, Sloane Kelly was head of security on the Nexus before getting kicked out after its arrival in Andromeda. She then found her way to the planet Kadara of the Govorkam system, and rose to a position of power among the outlaws there. As leader of one of the game’s factions, she’s a key player in the complicated politics of the Heleus cluster. Whether you approve or disapprove of what she represents, and how you deal with her as a result, is one of the key questions of Andromeda’s politics. Before joining the Andromeda Initiative, Kelly served in the Alliance with a “nearly spotless” record. Hotheaded and uncomfortable with authority, those few blemishes were a number of “altercations” with other officers. First revealed in footage of Peebee’s loyalty mission, Kalinda is a rival of your Asari squadmate in her search for Remnant technology (she asks if Peebee is “tracking that sweet signal too”). Ancient Andromedan tech isn’t her only interest, though: she instructs her henchmen to hinder the party, offering “a triple share to whoever brings me their sweet implants”, suggesting that the value of a Pathfinder’s SAM implants is widely understood. She also sics a Krogan outlaw named Krannit – whom you “keep running into” – on you. That about covers everything we know so far, but Mass Effect: Andromeda is still new, so we’ll update this as we explore further.